If what you’re doing is not working, then stop doing it. The definition of insanity is continuing to do the same thing over and over again and expecting a different result. I was looking through an investor’s entire domain name portfolio using DomainIQ.com and domain after domain after domain were two word .orgs, geographic .ios, and two and three word .com domains but with hyphens between the words. Now, if you’re going through DNAcdademy, I make certain rules crystal clear. One of those rules is that you should not be buying any hyphenated domain names unless you’re planning on selling them to buyers in Germany. Or, unless the domain name has a killer search volume in a massive industry like the domain credit hyphen card.com, then you should not be spending your money on hyphenated domain names. There must have been like 100 domain names in his portfolio that should be dropped. There’s a quick $1,000 in renewal fees that can be deployed into better domain names. Now is the time to realistically evaluate your entire portfolio. Are your domains selling, are they receiving inquiries, are they receiving traffic? If the answer is no, then put them into a bucket to drop. Don’t be romantic about your domains. Don’t fall in love with them. You’re not a collector of domain names, you’re an investor. 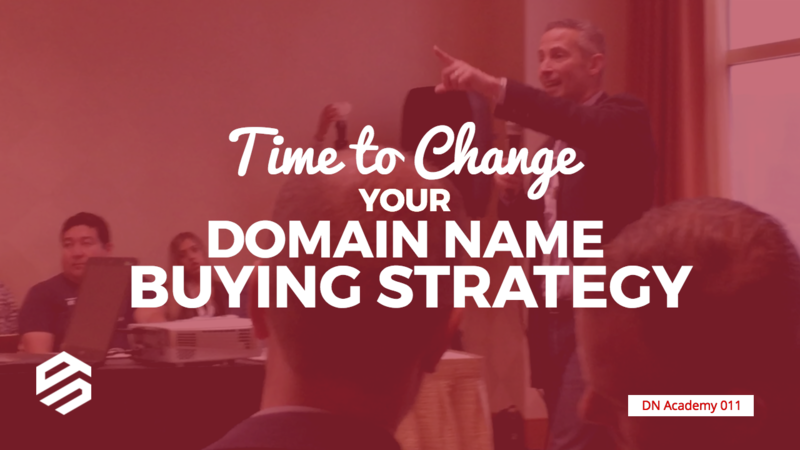 If your domains are not selling, now’s the time to change your strategy. Since going through your course, I think I have dropped at least 100 domains. valuable names have fallen through the cracks. Still it all comes under the heading of good experience and learning by doing! Your advice has saved me at least the cost of the course plus much more. Being a professional and full time domain name investor, one has to think and decide accordingly. Thanks for watching and sharing your viewpoint, AbdulBasit. Much appreciated! All these can then be set to forward to the website one is fencing. There are always other considerations……. I used to think the same way, Colin. I considered these hyphenated domains a way to prevent others from entering the space, even though I owned the version without the hyphens. After 10 years of holding them, I’m allowing them to expired and drop. I wish anyone who tries to build a business on them luck, as all the errors and typos of anyone visiting will come to my site. Building on a hyphen just doesn’t work. Yes, there may be an exception to the rule, but building on a hyphenated domain name if you’re US-based just isn’t worth your time and paying year after year isn’t worth it either. Anyone is welcome to do whatever they want, of course. My my opinion based on the data I have. Thanks for watching and posting your thoughts. They’re appreciated. It’s really a situation to rethink about those hyphen names when renewal comes. +1. You captured it perfectly. My take away is stop doing the same thing you’ve always done. Think. If after doing so, you still want to keep them — then great, you did it after actively thinking about it. Thanks for posting your comment, Sandy. Michael@ your definition of insanity in Domaining is irrelevant. For example: yxjk.com it was considered junk until two years ago yet they have been bought out since 2004. So for a period of 11 years Frank S. kept them and then sold a portfolio of 2,000 names for $3 mill.Can we say that he was insane ? after he sold the portfolio? That at the time(11 years) it made non sense in renewing them yet one day they were $2,500 a name? However i do agree that word-word.com or word-word-word are worthless given the fact that new G’s are here. My example was exactly relevant to the situation I described. You are providing an example of an exception case, similar to the other two exceptions I provided in the video (credit-card.com and selling to Germany buyers). On a side note, not really pertinent to this discussion: you said domains like yxjk.com were junk until two years ago, but they were not. More than two years ago these type of 4L .com domain names had value and liquidity. You can see them on NameBio.com selling as far back as 2012: https://namebio.com/?s==IDN1gzN3ATM They likely had values before then too, I don’t know when NameBio started recording data. Totally cool. And I wish you luck. You are clearly speculating on the value of these hyphenated short acronym and numeric domain names. They may go up, or not. Time will tell. These are not the kind of domain names that I was referring to when I stated that hyphenated domain names have no value. I meant the domains like domain-sherpa.com, back-injury-lawyer.com and red-rocket.com. Thanks for bringing up this example so I could clarify in the comments. I’m in full agreement with you, Michael. I need to drop my hyphens because no one has every contacted me. I once tried to trade another investor and they laughed and told me to let them go. I just couldn’t do it, but I think I need to now. Thanks for the push! There’s a discussion at namepros going right now that the OP asked what do you when you have no sales. One thing I do is go through my domains and giveaway to forum members. Thanks, Julio. I’ll check it out. There are many domains that don’t get offers but still have value. I suggest setting low (sub $3,000) BIN offers on those types of domain names so that when someone types it in, you can take advantage of their impulse and perhaps sell it. I also think that trading domain names can provide an opportunity for investors. Often times this is the case! While I have never liked the-names I am definitely guilty of falling in love with my “portfolio” I think I am going to actually try to sell some this year. I think your next post should be more MOTIVATIONAL pleaseeeese. Go get ’em, Wayno. Time to try to sell some! I have a good post coming up next. Stay tuned. if you need to sell to finance renewals regardless of the quality of your portfolio you are in trouble. large portfolio owners are dropping decent names that they have held for many years right now. this is a great opportunity for newcomers who know what a decent name is. I agree with your first point about having to sell to pay for renewals. Not a good situation. However, I’m not convinced that if someone else is dropping a domain name after years of holding it, that it is a good opportunity for newcomers. Clearly it depends on the name, but if the prior registrant never received any traffic, inquires or offers, then it might not be a great opportunity for a new investor either. Unless, perhaps, they’re going to do something more active to sell it that the previous registrant didn’t do. The newcomer can’t expect different results from doing the same thing as the previous registrant. Clipped 30 that just weren’t right. In 2016 I was holding about 60% .com inventory for resale but going to move it up to 80%+ over the next 2 years. Thank you for the insight Michael!! Great to hear, Stephen. Here’s to your success in 2017! Learning to drop domains is just as important as learning to buy the right ones.